Texas Texting & Driving Law Takes Effect September 1! Sen. Judith Zaffirini, D- Laredo, fought for this day through five legislative sessions comprising ten years. The bill, with her sponsorship, finally passed both House and Senate and was signed into law by Gov. Greg Abbott on June 6, 2017. Now there are only three states remaining without a texting while driving ban – Arizona, Missouri, and Montana. This issue’s long journey included passage of a bill by both the House and Senate in 2011, but a veto by former Gov. Rick Perry. In 2015 it passed the House, but fell short in the Senate. Even before this law, there were restrictions on phone use in Texas, such as a ban in school zones, drivers under 18, and bus drivers with minor children on board. While waiting for a comprehensive Texas ban, more that 95 cities passed their own local ordinances banning some uses of phones while driving. Some say the law, as written, doesn’t cover enough distracted driving actions, such as applying makeup, eating, or using GPS. Even when the limited law is broken, the fine of $99 for a first offense and up to $200 for subsequent offenses may not be enough of a deterrent. Critics say the law may be hard to enforce and even confusing to law enforcement as they are only allowed to ticket a violator for texting, not other phone uses. Since using GPS on a phone is still legal, it may enable officers to stop motorists when they are legally using their phones. Even if texting, drivers could easily switch to a GPS app to avoid a ticket. Sen. Larry Taylor, R-Friendswood, pushed to amend the bill requiring police to actually witness a texting offense before initiating a traffic stop. Taylor stated, “I don’t think that makes me more less safe than someone eating a hamburger, putting makeup on, reading their newspaper on the steering wheel or reading a novel as they drive down the road. I’m much safer than those people.” Taylor’s amendment did not pass, however. Zaffirini read to other senators the names of people injured or killed because of texting while driving, also noting police did not witness the accidents thus countering aspects of Taylor’s amendment. Sen. Joan Huffman, R-Houston, agreed that, though the law may not stop texting while driving, it may cause hesitation. “If this saves the life of one teenager who decides ‘I’ll wait til I’m at the stoplight’ or, ‘I’ll wait until I pull into Sonic and then I’ll text,‘ then we’ve accomplished what we set to accomplish,” she said. From 2010 to 2015, pedestrian deaths in the US grew by 25 percent. An estimate by the Governors Highway Safety Association (GHSA) predicted another 11 percent climb between 2015 and 2016. As a percent of total vehicle accident deaths, there was an increase from 11 percent in 2006 to 15 percent in 2015. These numbers may have increased for a number of reasons, such as demographics, economics, weather, the total vehicle miles, and the time spent walking. 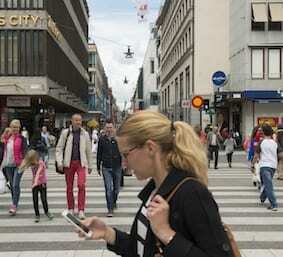 Another likely factor is the widespread use of smart phones for both drivers and pedestrians. According to the GHSA, there are five basic reasons. • Health – The benefits of walking are well known: it’s available to almost everyone, it’s inexpensive, and it can reduce the risks from stroke, diabetes, heart disease, and obesity. • Transportation – A 2009 found a significant percentage of trips are less than one or two miles long, making walking a viable alternative to driving. In 2015, the U.S. Census Bureau’s American Community Survey (ACS) reported over four million people walk to work each week. • Economic – Walking is free, operating a car is approximately $8558 a year according to AAA. • Environmental – While walking causes no negative impact on the environment, motor vehicles create a number of environmental issues. • Transit – There are many people using public transportation, which requires walking to access the transit system. Time – As might be expected, night is the most likely time of day with 74 percent of the deaths. Impairment – Alcohol involvement by either the driver or pedestrian is a factor in almost half the accidents. Increasingly, that includes texting. Location type – Over 70 percent of fatalities were in non-intersection locations, such as mid-block or highways. State – California, Texas, and Florida had the most pedestrian fatalities in the first six months of 2016, the most recent data. However, as deaths per 100,000 population, Delaware, Florida, and Arizona topped the list. Some strategies include increasing the separation between pedestrians and motor vehicles, such as installing sidewalks, pedestrian overpasses and underpasses, new traffic signals. Making walkers more visible is another option with improved lighting and high-visibility crosswalks. A third option is to add deterrents, such as speed bumps, roundabouts, and bicycle lanes. • Adoption of Complete Streets policies, which direct transportation planners and engineers to routinely design and operate the entire right of way to enable safe access for all users, regardless of age, ability, or mode of transportation. As mentioned, there are many reasons for the increase in pedestrian deaths, but one comes to the forefront: increased use of mobile phones by both drivers and pedestrians. The Wireless Association reported multimedia messages increased by 45 percent from 2014 to 2015 and the volume of annual wireless data usage more than doubled. From 1.1 billion multimedia messages in 2005 to 218.5 billion in 2015, the growth of this deadly distraction is exponential. An average texter looks away from the phone for 23 seconds, meaning the vehicle is traveling a significant distance with no operator. Since texters have a 23% higher chance of causing an accident, that impairment equals drinking four beers, which can result in weaving and the inability to stop on time. Currently Texas is one of four states without a statewide texting ban. That will soon change as a no-texting bill passed the Texas House and Senate and now awaits the signature of the governor. Though states and enforcement agencies can plan and implement various safety strategies to slow this rising tide of pedestrian deaths, the bottom line is that every one of us – drivers or pedestrians – must pay attention to our surroundings and leave distractions for safe areas. Thanks to Pedestrian Traffic Fatalities by State – 2016 Preliminary Data Prepared for Governors Highway Safety Association by Richard Retting, Sam Schwartz Transportation Consultants for much of this information.